Dummberry is making his trail longer every day, and it looks like while he's on his athletic journey, his favorite kicks of all time include the famous Swoosh by +Nike ! That is one sporty foot.. er, shoe.. well, goo! 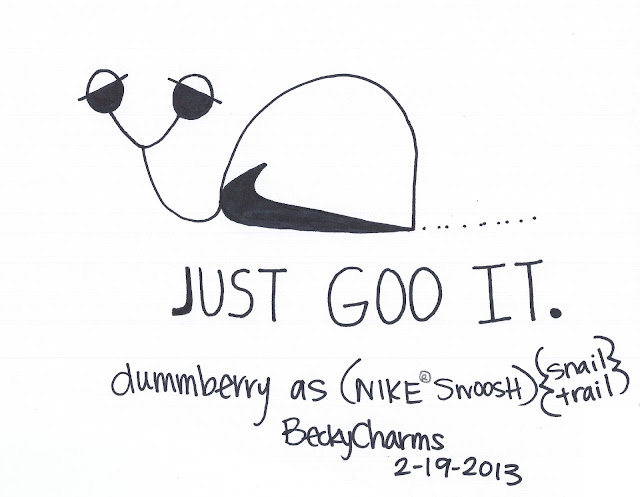 Just Goo It, by dummberry. With his sporty shoe..foot..goo.. looks like he also pulled in his little tail.. instead of the "tuck and roll".. looks like he's sporting the "tuck and stroll". You're so clever, dummberry. Follow more dummberry on his snail trail . . .. . .. .. . .. . . . .. .. . .